Christie Brinkley, Matt Lauer & Tyler Perry are buying or selling homes. The latest real estate news is featured at TopTenRealEstateDeals.com. Christie Brinkley has put her longtime Hamptons estate on the market asking $29.5 million. With his own movie studio and performing many of the major roles himself, Tyler Perry has made a fortune with his films. In his spare time, Tyler has frequently bought and sold real estate across the country including the most expensive home ever sold in Atlanta. His most recent acquisition was in 2016, a 10-bedroom, 11-bath, steel-and-glass home in Beverly Hills that he purchased for $15 million. Tyler recently sold the home to Pharrell Williams for $15.6 million. When Jackie Kennedy was 13 years old, she moved into her stepfather's home in McLean, Virginia where she lived into her college years at Georgetown. Merrywood was built in 1919 in the classic Georgian style on 46 acres above the banks of the Potomac with 23,000-square-feet, nine bedrooms, 13 baths, swimming pool and tennis court. The home recently sold to the Saudi government for $43 million and will be used for visiting dignitaries. A 56,000-square-foot home in Bel Air that was built in 2007 for the father of Gigi and Bella Hadid recently sold for $56 million. The French chateau-style mansion on 2.2 acres includes a ballroom, Turkish spa, ten bedrooms and 14 baths. Mohamed Hadid sold the home for $50 million in 2010. It recently came back on the market at $72 million. New Zealand has a requirement that foreign home owners of important properties must be of 'good character,' which put Matt Lauer in jeopardy of losing his 26,500-acre ranch there. Matt purchased a lease on the property last year but his recent sexual impropriety accusations triggered the investigation. The New Zealand government has given Matt a pass for now, so he gets to keep the five-bedroom home and ranch. According to a new study from Bloomberg, South Florida includes the #1 and #3 zip codes for the wealthy. According to Bloomberg, the top spot goes to Fisher Island with an average annual income of $2.5 million. The small island, located a few miles from Miami Beach luxury condos and night spots, was originally developed by Carl Fisher who in the early 1900s was largely responsible for starting Miami Beach, the Lincoln Highway and the Indianapolis 500. The # 3 spot goes to Palm Beach, Florida with average income of $1.25 million per year. A San Clemente, California home, La Casa Pacifica, that Richard Nixon bought in 1969 for $1.4 million and used often during and after his presidency, is for sale at $63.5 million. Built in 1926 by financier Hamilton Cotton, the home is sited on a bluff with over 400 feet of beachfront. The estate includes a main house of 9,000 square feet, four bedrooms and seven baths; a one-bedroom, one-bath pool pavilion; and multiple apartments for guests and once used by the Secret Service. One of the biggest and most expensive Florida luxury homes on the market, NBA legend Shaquille O’Neal is asking $28 million for his 28-room lakefront mansion. The 31,000-square-foot home includes 12 bedrooms, 15 baths, massive living room and a gentleman’s room with game tables and wet bar. In addition to a Superman statue, Shaq added a wall mural of a true-to-size tractor trailer with front cab bumped out of the wall rolling on a freeway. His home is about 30 minutes from DisneyWorld. 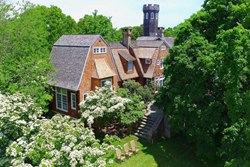 One of America’s most popular supermodels, Christie Brinkley, has put her longtime Hamptons estate, Tower Hill, on the market asking $29.5 million. The 20-acre compound in Bridgehampton is named for a century-old observation tower that was built as part of the main house in 1891. Eric and Donald Trump Jr. have purchased their aunt's eight-bedroom Palm Beach waterfront home. The president's sister and U.S. federal judge, Maryanne Trump Barry, put the home on the market in December for $22.9 million and soon raised the price to $23.9 million. The brothers did get the Trump-family discount paying $18.5 million through an LLC. John Legend and Chrissy Teigen have purchased a new penthouse apartment in the same building they previously owned in New York's North of Little Italy neighborhood. The new parents paid $9 million for the apartment. They had sold their one-bedroom apartment in the same building in 2016 for $3.9 million.